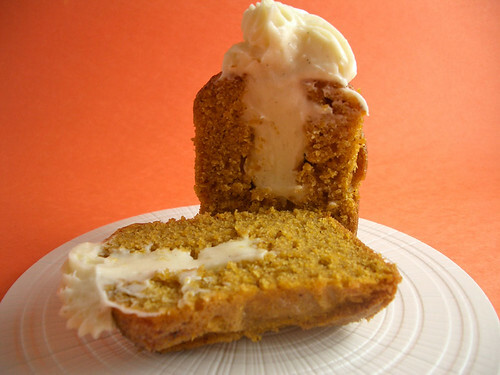 I am really enjoying the Bouchon Bakery Cookbook I got for Christmas and have baked another goodie that I think you will really enjoy: Pumpkin Muffins with Vanilla Bean Cream Cheese Frosting. These jumbo sized muffins have a surprise inside: a delectable vanilla bean cream cheese frosting that also peeks out on top in a tiny swirl to hint at what’s inside! All muffins in this cookbook are made over two days: one day to make the batter, let it rest overnight in the fridge, then bake them the next day. This process allows the flour to hydrate and creates a very moist muffin. I can tell you that these muffins are very moist, delicious and pumpkiny! The vanilla bean cream cheese frosting is gilding the lily and provides a sweet creamy richness speckled with tiny vanilla bean seeds that is the perfect compliment to the moist crumb. I added a little coarse cinnamon sugar on top of the batter before baking to create a crunchy spicy topping to my muffins. The recipe calls for golden raisins but I decided to leave them out and let the pumpkin be the main attraction. The recipe also calls for a six cup jumbo muffin pan. I don’t have a jumbo muffin pan but I do have a six cup popover pan and it worked out great. I also didn’t have any jumbo muffin papers so I cut 8″x8″ squares of parchment and pressed them down into the cups with the lid of a Pam spray bottle. Again, this worked great and I actually like these better than the regular muffin papers. Here is how you can make your own. You can find the recipe here. Remember: this batter will rest in the fridge overnight to be baked the next day. Batter: In a medium bowl whisk together the flour, baking soda, cinnamon, cloves, nutmeg, allspice and salt. Set aside. In the bowl of an electric mixer fitted with the whisk attachment mix together the sugar and oil until combined. Add the pumpkin and increase the speed to medium low and mix for one minute until smooth. Add the flour mixture in two additions on low speed until just combined. Remove bowl from mixer and scrape bottom of bowl to incorporate any dry ingredients that may have settled there. Fold in the raisins if using (I didn’t use raisins). Transfer batter to covered container and refrigerate overnight. Baking: Line a six cup jumbo muffin pan with liners (I used a six cup popover pan with 8″x8″ squares of parchment paper) and set aside. Preheat oven to 425 degrees. Transfer batter to pastry bag and pipe the batter into the cups, stopping 1/2 inch from the top. Top batter with a sprinkle of coarse cinnamon sugar if using. Put pan in the oven and lower temperature to 325 degrees. Bake for 45 to 48 minutes (I baked mine for 45 minutes) or until a toothpick comes out clean. Cool muffins completely before filling with frosting. Frosting: Place completely soft, room temperature cream cheese into the bowl of an electric mixer fitted with the paddle attachment. Beat on low speed until smooth. Add the vanilla bean seeds or vanilla bean paste and mix until incorporated. Transfer frosting to a pastry bag fitted with a french star tip and place in the fridge to chill until muffins are completely cooled. Filling Muffins: When muffins are completely cooled, cut through the tops with a sharp knife or use an apple corer to remove all the centers. Fill the centers of all the muffins with the frosting and pipe a small rosette on the top of each.